I will define another category of Reactive Dogs. In the past, I have written about dogs who are very social and react because they are “Persistent Players” and love to play with dogs. 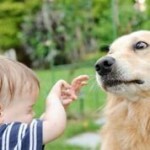 Our canine friends have different reasons for reacting at the sight of another dog. Once you are able to identify “why” your dog is acting this way, then we can put a training plan in place. For this Blog, I am defining “Persistent Sniffers” These dogs primarily investigate their environments using their nose, as seen by their heads to the ground often. They are slow to come when called because what they are sniffing is very important to them. They become activated at the sight of a dog seen by their chaotic foot movements and exaggerated joint flexion. They are environmentally confident and have no hesitation navigating new places. They may be vocal when they are unable get to what they want. They are persistent in nature, seen by their continued attempts to get to what interests them. 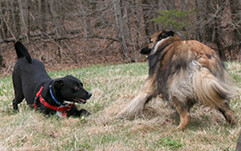 When off leash, these dogs may have a history of greeting unfamiliar dogs with a thorough head to tail scent intake, yet are quick to disconnect and move along. Some will initiate play, but only after they have fulfilled their olfactory needs. If I just described your dogs preferences, then it is likely your dog has already been labeled reactive. Now you can see that he is indeed frustrated, and better understand that his temperament is partly responsible for driving his behavior. 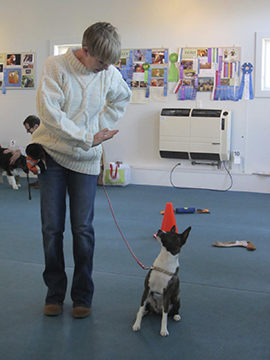 For dogs who are food or toy motivated you can often reward an alternative behavior. For dogs who are less food motivated management is often recommended as some dogs are so persistent nothing will override their preference. This was the case recently with a handsome Golden Retriever mix who was lunging on the leash at the sight of any dog. As he entered my office, I noticed he immediately put his nose to the ground and sniffed the rug, toy box, dog bed, shelf and furniture. At one point, he briefly made eye contact with me as he entered my space, I reached out to him but his awareness went to sniffing my pants and shoes. He was unable to be off leash as he would not come when called, he always had his own agenda when outside. While he ate the treat I offered, he was more interested in using his nose once again along the dog bed. When outside, he did as his owners predicted. 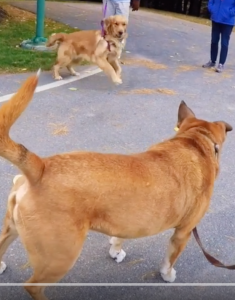 He began to jump around with chaotic foot patterns, barking rapidly, and pulling on his leash to get to my dog, Pablo who was sitting calmly ignoring the bouncing Golden. I let the Golden walk past Pablo a few times so the Golden would clearly see that Pablo was not engaging him in any way. Pablo went so far as to give a few low growls, but there was no change in the Goldens behavior. I then let them take their boy far away for several minutes so he could recover from his highly aroused state. At this distance, he was rewarded for reorienting to his handler. We repeated this approach and retreat many times as described in Behavior Adjustment Technique (BAT). Each time we were about 30 feet apart, the Golden repeated his request to engage Pablo’s. Pablo’s preference is food, so he completely ignored and even sat with his back to the Golden for 15 minutes or more. Eventually, Pablo turned towards the Golden and gave a hard eye stare accompanied with a stiff body and low growl. The persistent Golden paused briefly, but was unable to change his behavior. We took a break and walked far apart to aid in the golden’s recovery. It is rare for a dog to not read Pablo’s cues, he is known for being very clear. What happened next was a rare behavior for Pablo, having only witnessed a few times with persistent barking dogs. Pablo’s tolerance wained and he told the Golden in his own way that no amount of persistent barking and jumping was going to change his mind. Pablo was very clear that he did not want this Golden in his space. Every dog trainer needs a Pablo! This golden was to avoid leash greetings as he was unable to respond to dogs appropriately. His preference to get at the dog near him was overriding all thinking. It was a matter of time before his persistent nature got him a severe reprimand from a dog who had said “go away”. After Pablo’s clear message, the golden was able to reorient to his handler and be rewarded. This is a version of Look at That (LAT) and can be successful with many dogs. Because he was so frustrated and not showing any aggression, I suggested he gain further socialization with good dogs while off leash. 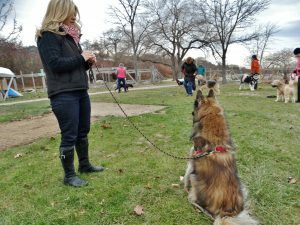 This was our next session and he did as expected, he sniffed all the dogs and the entire park. While there was no play from him, there was also no aggression. Many dogs are labeled “reactive”, however this is a big bucket term. If you observe your dogs preferences, how he engages with his environment and how he responds to both familiar and unfamiliar dogs, you may be able to identify why your dog is acting this way. If he is simply frustrated, determine his preference and find a way to allow him what he so desires. If you have tried “reactive” dog classes with no luck, consider your dogs persistent nature and how it effects his every day behavior. It may be that your dog is unable to change because his preference is so extreme, you may not be able to offer him anything more valuable. You may just need to meet a few Pablo’s to help your dog with his impulse control. Your dog has bitten a human and everyone is telling you to “euthanize your dog”. First, take a breath and let’s assess the situation and understand why this bite occurred before making any decisions. Consider the environment first and see what was happening. Now, think about the dogs emotional state, shy with new people, startled by a sound or stimuli, sleeping, highly aroused, barking frantically, sitting nicely beside you, or guarding a resource? Snapping at this boy would be a normal response for this golden. Most dog owners feel utterly shocked and embarrassed their dog would bite a person. They feel to relieve their guilt, they need to succumb to the pressure of family and friends and kill their dog. I have taught many dogs with bite a history a soft mouth, yes, an older dog can learn and change. Guarding a resource that is worth fighting for. Being approached while confined by a lead. When a stranger enters their home. Waking a fearful dog can result in a bite. Medical imbalance can cause dogs to over react. While trying to defend themselves from being attacked by another dog. If the growl does not get you to back off, a bite may just work. When a fearful dog is cornered. Some dogs actually learn that biting works. Giving the dog a choice in the relationship. We have all heard, “My dog is protective, ignore him.” If you are afraid then put him in a safe zone. If not, play a treat and retreat game, to keep you safe and let a shy dog know of your intentions. With the dog on a 6 foot leash let the dog approach you, stand at an angle to the dog, stay soft in your joints and, blink often. Toss a high value treat at his feet and then toss one behind him, repeat. If a dog chooses not to come near you or make contact, then you do not touch him. If he chooses to approach you, continue tossing treats or hand feed then toss a treat behind him. Hand feed him again then tossed one behind him, repeat. Turn to walk away, toss a treat and walk away from him, toss a treat and walk away, repeat. If he is coming closer to you and has an open mouth and soft body, hand feed him, toss a treat away as you walk away. Ask the dog if he can sit or shake. If a dog can not do a behavior then do not touch them. If however he sits and or gives a paw, toss him a treat and repeat this pattern. Ask him to sit, touch him under his chin, feed him and tossed him away. Continue this pattern of letting the dog approach you, sit, touch briefly and with the back of your hand, then toss him away. Be aware of the dogs body language, any change will tell you you are moving too fast for his comfort. This dog is about to move away from the lady and her child. Criteria changes here for each dog depending on how they feel about the environment and progression. Removing social pressure and letting the dog choose to be approached or touched is key for many shy dogs. Please respect your friend’s dog by giving him a choice in the relationship. Remember, not all dogs are social with people. Briggs is practicing a down stay in the field. 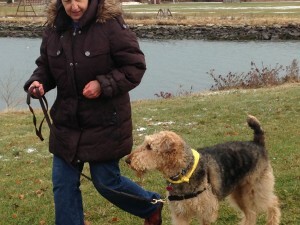 This is Blog #4 in helping the dog who is barking and lunging at people. Step 1. Management; prevent him from practicing the unwanted behavior. Step 2. Desensitization and counter condition; change how your dog feels. Step 3. Understanding your dogs Distance Cues. Step 4. 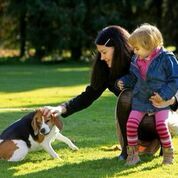 Emotional Control Exercises, teaching your dog to sit and down stay will help your dog have better emotional control. Begin training sessions of 5-10 minutes several times a day in a low distraction environment. (Some where in your home is a good place to start). The secret to a good stay is to not move through the stages too fast. Build up gradually by adding duration and distractions. Nice sit stay in the heel position by Layla. Using the Collar: Say dogs name and ask dog to sit, touch the collar and say “stay” while holding a flat hand in front of the dogs face. Reward quickly with a few treats, repeat. Now try it without holding the collar, “come, sit, stay” reward, reward, then release. Repeat while standing. Using the Leash: Say dogs name and ask dog to “sit, stay” while a raising a flat hand. 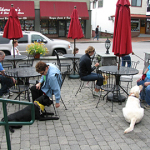 Reward quickly with a few treats, then release your dog and repeat. Duration: You may have to reward with treats every few seconds, then release your dog. The goal is your dog will want to “stay” as this is rewarding, when you release him the food stops. If your dog moves before you release him, walk or look away and try the pattern again but reward generously until they understand what it is you are asking. Add Criteria: Using your dogs daily meal, repeat this pattern “come, sit, stay” or “heel, sit, stay” reward and release, repeat while adding duration in every room of your house. 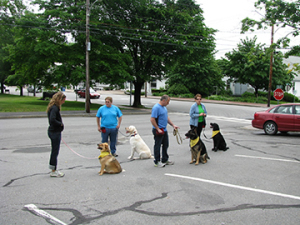 Add higher criteria by having a familiar person walk past and reward generously if your dog holds his sit, stay. If he breaks, no worries, show him the food and repeat the pattern until he is successful. Progress to sit, stay outside in the driveway, yard and street with no distractions then add criteria by having a familiar person walk past and reward generously for good emotional control. Down stay in a public place. Success: By now your dog understands that when a person walks by “good things can happen.” If your dog training is failing, I will bet it is because the criteria is too high for the dog. Set your dog up for success and reward many repetitions of sit, stay or down,stay in many locations with only familiar friends passing by. As your dog matures, he will develop better emotional control in a variety of situations AND see people passing by as a predictor that good things can happen. If your dog does not have strong emotional control at home, then please do not ask him to sit and stay in a public location as this criteria is too high. Time Frame: Each dog will progress at a different pace and they can only go at their pace. Factors that change how your dog feels and reacts can include how a person smells, how tall they are, male or female, how fast they move, if they make direct eye contact, if they are nervous, lean over the dog, cough, laugh or even stomp their feet. If there is one person or several makes a huge difference how each dog feels. If your dog goes over his comfort level, he may lunge and snap. Do not punish, simply slow the progression down until you reduce your dogs fear. Breakfast was earned holding a down stay in different locations. about either of my dogs lunging or biting a guest. 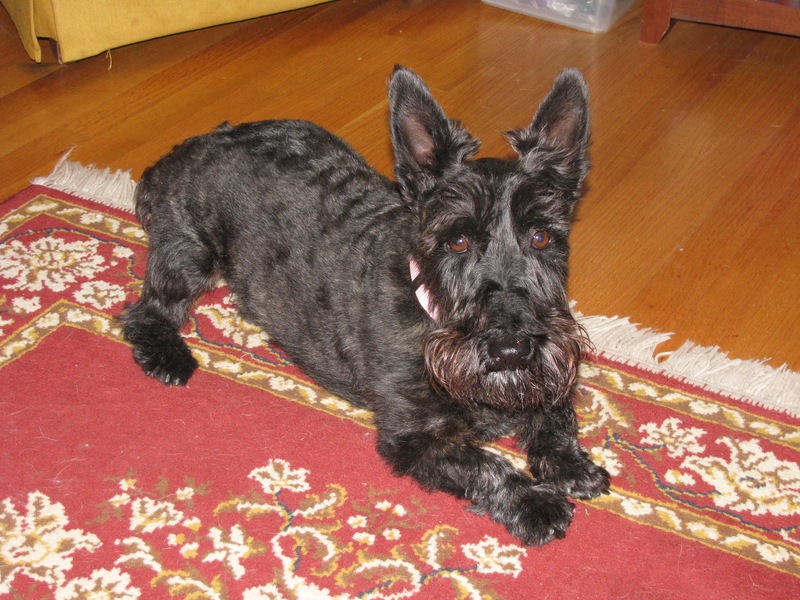 I rescued my Scottish Terrier at 5 years of age with a history of multiple bites, after 18 months of training she passed her Canine Good Citizen Certification and can now greet people in my house. For months, I had to introduce her to guests on the street, then in the yard and eventually inside my home, this is a detailed desensitization process. The good news is you will get there with your furry friend, just take your time, manage when you can not train, train below your dogs threshold and practice daily using his meal. 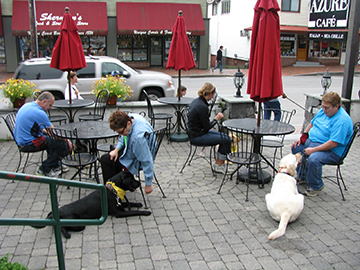 This is the first of a five part segment, to help dog owners with dogs that act aggressively to strangers. A practical guide to helping owners with dogs who rush and bark at people through windows, fences, at the front door and on leash. If your dog displays these behaviors, at guests when they enter, your dog may be shy or fearful of strangers. Reducing his fear is essential to changing his behavior. Keep in mind this behavior can simply be frustration as well, determining the difference is another topic! Now, Steps in helping the dog who is barking and lunging at people. Step 4. 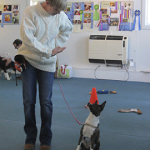 Emotional Control Exercises; help your dog have better impulse control. Let’s start by understanding how to effectively manage the adolescent dog so he is not becoming worse during your training. The key is to prevent your dog from practicing this barking behavior when in the home, car, yard, or anywhere. Management: means changing the environment so your dog is not being put in a situation that triggers his fear or pushes him over threshold to this barking behavior. These negative experiences will slow your training process and are often practiced as they are rewarding to your dog. Behaviors that are practiced will not fade or change, so management is essential during your training. 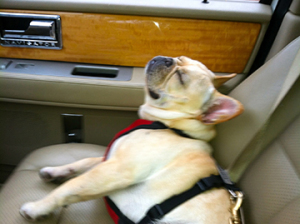 I wish all my dogs were this relaxed while riding in a car. For example, if your dog barks at people when in the car, you can put your dog in a comfortable crate with chew toys and a light sheet over it so your dog cannot see people. Before putting your dog in any crate, you want to condition this crate as a safe and comfortable place to be. Feeding your dog in the crate for several days can help your dog feel safe in this crate. Another option is to tape some wax paper up to the inside of the car windows, while not a fashion statement, it can be effective. For the dog that runs the fence line barking daily, this behavior should not be allowed to occur. Fences can often cause frustration, so spending time with you dog outside is essential to prevent unwanted chasing and barking. You might consider moving the fence to the back yard only so your dog can not see people passing. Windows in the home can easily be covered with wax paper to block the view as this can be a trigger for barking. Moving the furniture so your dog cannot sit high enough to see out, or using baby gates to block access to these environments is also recommended as effective management. While out for a walk on a leash, I suggest you have a plan to avoid people within the distance that makes your dog become aroused or stressed until you have a chance to desensitize and counter condition this behavior. If your dog can pass a person 40 feet away without showing signs of stress or arousal, then this is where you should keep your dog so he is having a successful walk with little stress. My next blog in this series will complement the management techniques discussed here. It will detail exactly how to change this type of behavior using the scientific approach of desensitization and counter conditioning. 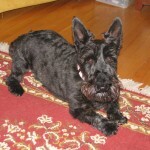 This is how I helped many clients dogs and changed my Scotty’s behavior after adopting her at 5 years of age. The complete timeframe for this process can be from 6-months to 2-years, depending on the dog. 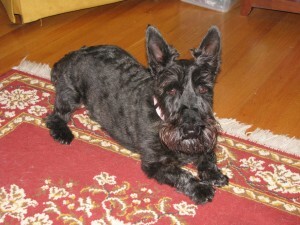 For my Scotty this process took 18 months, and it was well worth the effort as she is now living a much calmer and happier life! See you soon for more practical training for dogs who bark at humans. If humans better understood dogs body language then we would have less dogs resorting to a bite when they feel stressed or threatened. We see several cues that this scared boy does not want to be touched. Signals that are asking for distance are often very subtle. 1. Dogs body is leaning away from the approaching hand. 2. Dogs paw is raised in a submissive manner. 3. Head is moving away asking for increased distance. 5. Mouth is closed, rather than open and relaxed. Dogs often ask for distance in the only way they know how, but if the scary hand keeps coming, your dog may resort to a level 2 distance cue like a Growl, lip curl or show of teeth with a rigid body. I HOPE your dog growls rather than bites. Hence, do not punish the growl as it is an effective distance cue. When the dog is punished for growling, but is still afraid of that hand coming as it predicts pain, he may bite to protect himself. Have you heard of someone who was bitten by a dog in the face while they were attempting to pet him or rub his belly? It is probable the dog used some distance cues before he resorted to a bite. Unfortunately, it is likely the human did not understand the signals and continued forward until the dog felt so threatened he did not have time to use a more moderate level one or level two response. Dogs that are fearful or have been threatened by a previous human will be on guard and defensive. Canine behaviors asking for distance are far better than an attack with a bite, so please do not punish them. Rather, simply remove the approaching stimuli. Can you teach a dog a level 1 distance cue like a look away? Absolutely, but it takes time and patience — and it is well worth the effort!